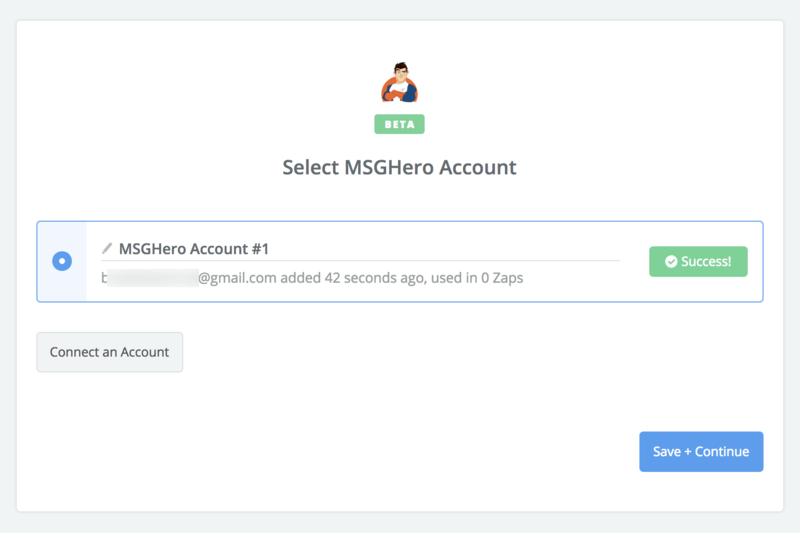 Connect MSGHero to hundreds of other apps with Zapier! 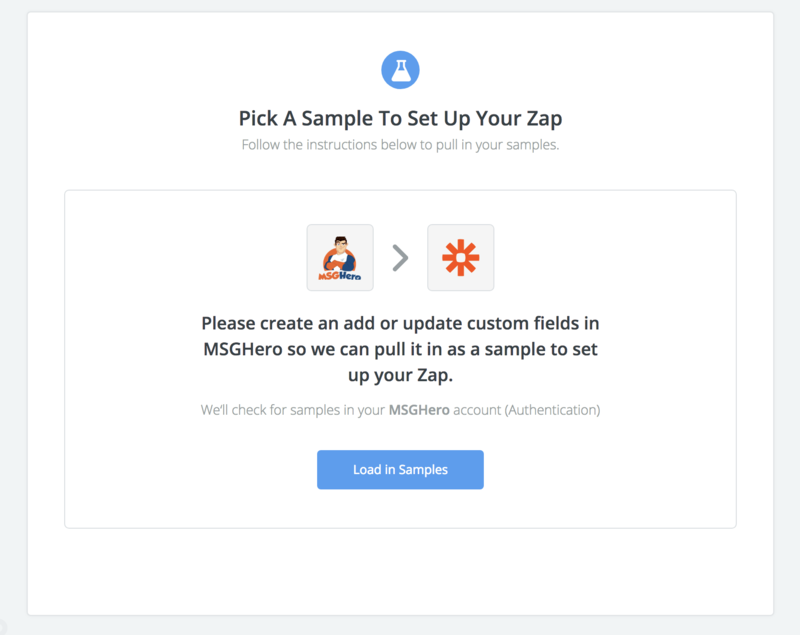 Zapier lets you connect MSGHero to 1,000+ other web services. Automated connections called Zaps, set up in minutes with no coding, can automate your day-to-day tasks and build workflows between apps that otherwise wouldn't be possible. Each "Zap" has one app as the **Trigger**, where your information comes from and which causes one or more **Actions** in other apps, where your data gets sent automatically. Note: Here is our tutorial on how to collect email addresses inside your Messenger bot and sync them to your email auto-responder service. 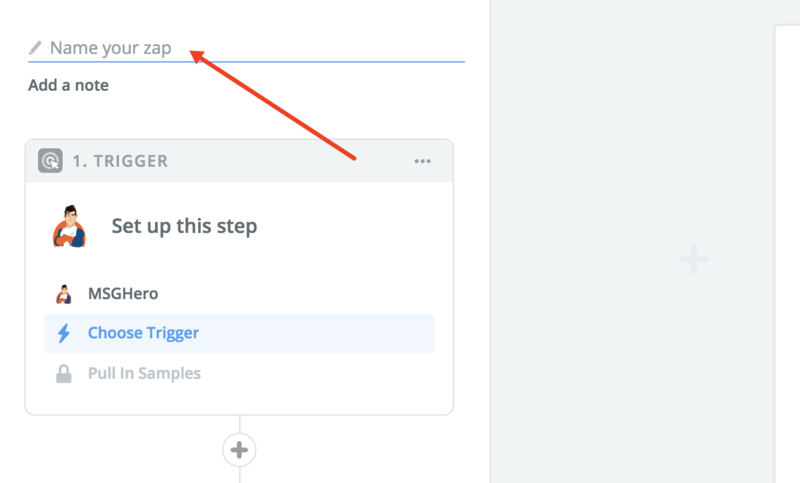 Once logged into Zapier, click on the "Make a Zap" button in the top navigation menu. Search for "MSGHero" app in the top middle search bar as shown below. Click on "MSGHero" and then click the box from the search results. You'll now be able to set a name for your Zap. Next, we'll select our trigger. This is when a custom field (such as an email address or phone number) is collected through your Messenger bot. 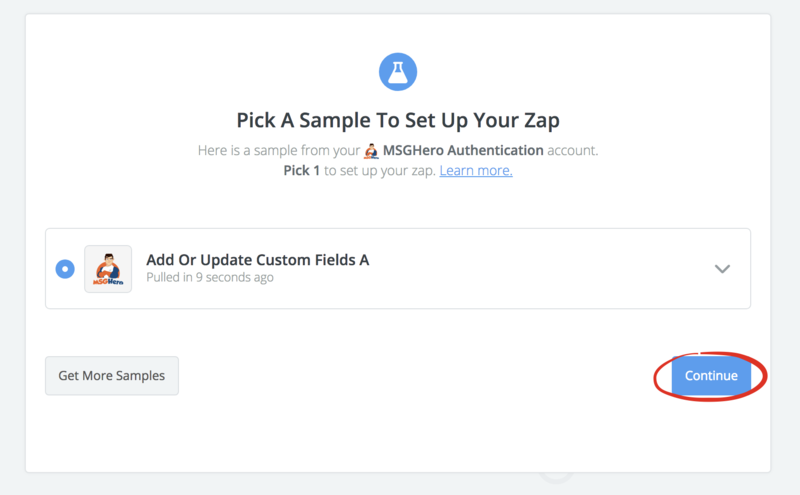 You'll be able to create a 'zap' that will trigger the custom field (such as the email address) to another selected Zapier app (such as your auto-responder). This is when a new user subscribes to your Facebook page's Messenger bot. Please note, this is only the default subscriber information we receive from Facebook such as their name, language, gender, Facebook user ID, "added on" timestamp, time zone and their page ID. Their email address is only triggered through the "Add or Update Custom Fields" trigger, not this one. Select one of the above triggers and click on the "Continue" button. Next, you'll be asked to "Connect an Account". 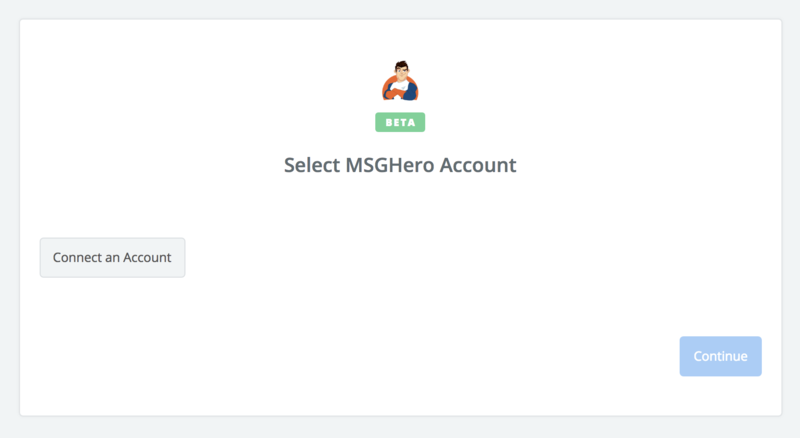 A pop-up will appear where you'll need to enter your MSGHero username, password and your Facebook page ID (this must be the same Facebook page your Messenger bot is connected to). Scroll down right to the bottom and you'll find your "Page ID". Simply copy and paste that into the "Page ID" field in the Zapier pop-up. Click on the "Yes, Continue" button once you've entered the required fields. Your account should now be authenticated. You can click "Test" to test the authentication. If it says "Success" (as shown below), you may click the "Save + Continue" blue button to proceed to the next step. Next, you'll see the screen below (it will depend on which trigger you selected - in this case I selected the "Custom Fields" trigger). Click on the drop-down arrow. 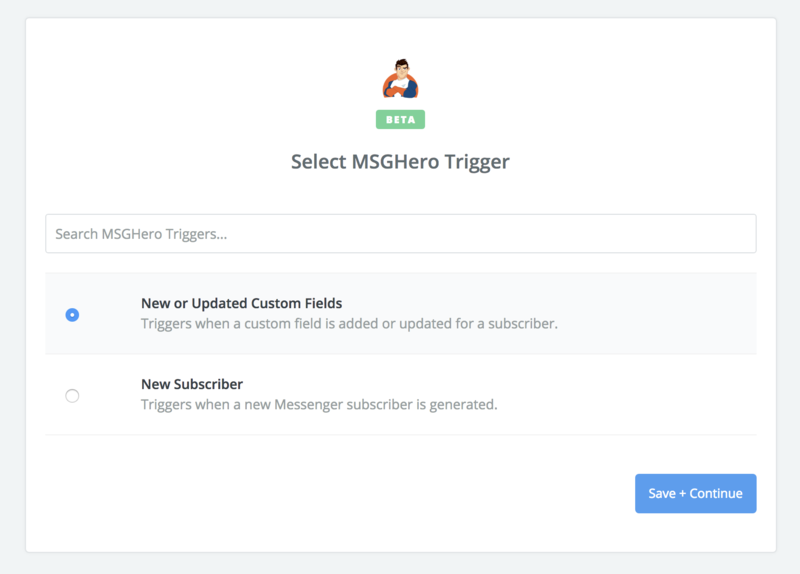 From the drop-down menu (wait for it to load), select a custom field that you created inside your MSGHero Messenger bot. This will be the custom field that will be "zapped". Once you've selected your custom field, click on "Continue". Now you'll need to test the connection by clicking "Load in Samples" as shown below. 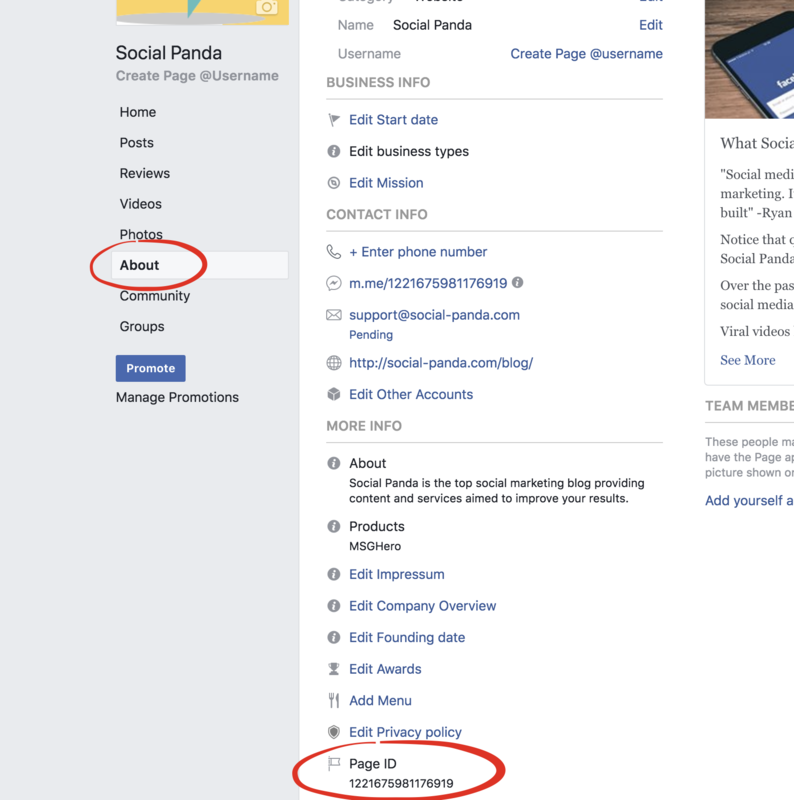 It will only load a sample if you have at least one Messenger subscriber for your Facebook page. Once it has loaded a sample (as shown below), click "Continue". Now we've connected MSGHero, it's time to connect our "Action" step. Let's assume we want to integrate with an auto-responder such as "MailerLite" (you can search for any other Zapier integration by using the search bar). 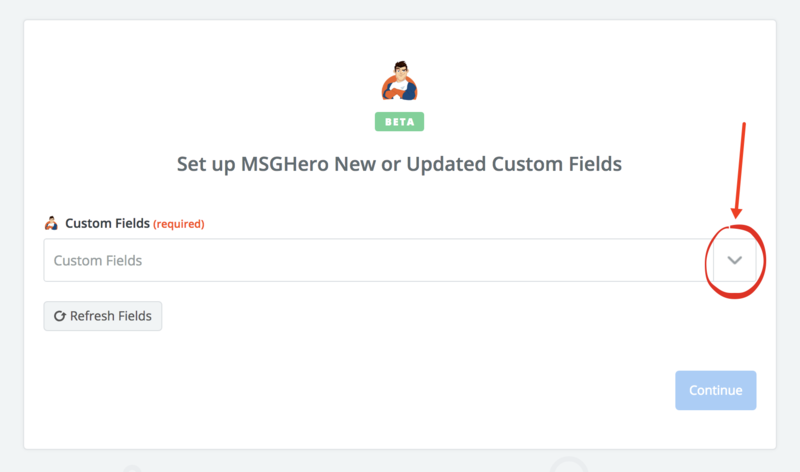 If this is the case, please note you will have to have an "Email" custom field set up inside MSGHero because you do need to match the fields so it knows what custom field to pass to your auto-responder (in this case, to pass the email through to your email list). For the purpose of this article, we'll go with "Google Sheets". 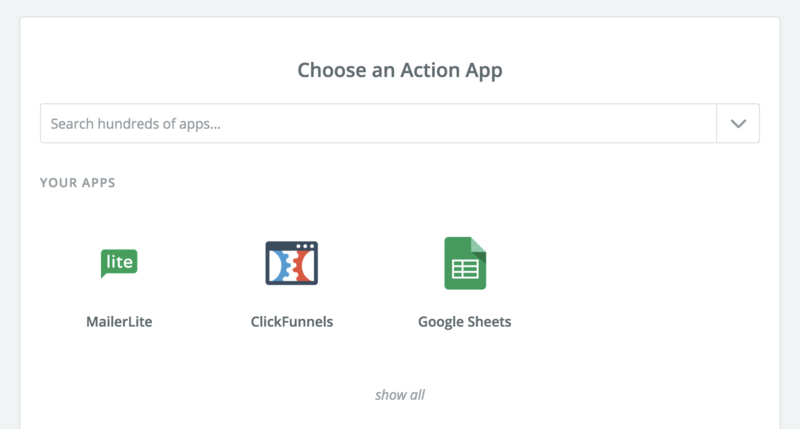 Next, you'll select your action for the "Google Sheets" app integration. If you select the "Create a Spreadsheet Row" action (for example), it will automatically insert the data you collect from your Messenger bot's custom field into the spreadsheet you select. Click "Continue" once you have select your action. 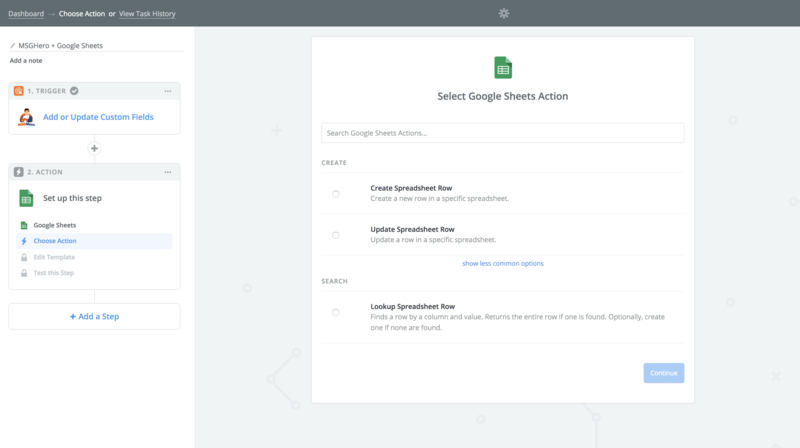 You'll now be prompted to connect your "Google Sheets" account so it is authenticated. Once that is done, click on "Save + Continue". 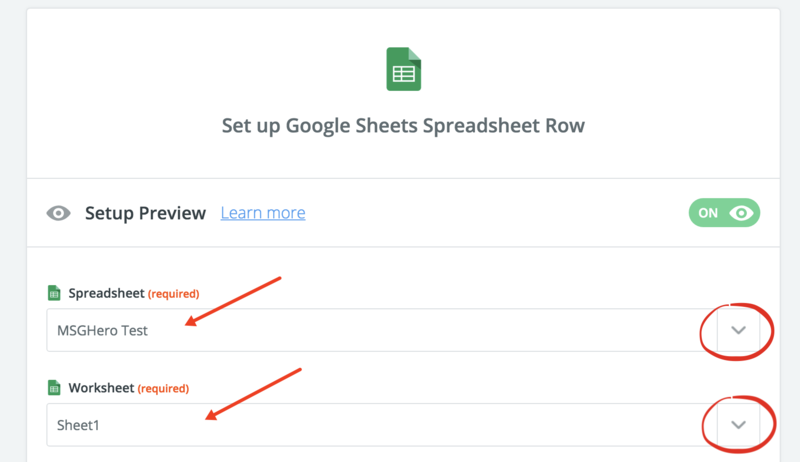 A new page will request you to select a "Spreadsheet" and a "Worksheet" (both required) to insert the data to. Once you have selected a spreadsheet and worksheet, more options will become available. Here is where you need to match your fields. As you can see in the screenshot below, there is a "Name" field. If I wanted to collect the name of the Messenger subscriber, I simply need to click the + button as shown below in the "Name" field and match it to "Name" (a field collected inside of MSGHero). If I had chosen "MailerLite" as my auto-responder and I was collected email addresses of my Messenger subscribers, then I would find the "Email" field and match it to my "Email" custom field. Once you have matched all your fields (they are all optional, so just match what you want to "zap"), scroll down and click on the "Continue" button. Next, you can test the connection. 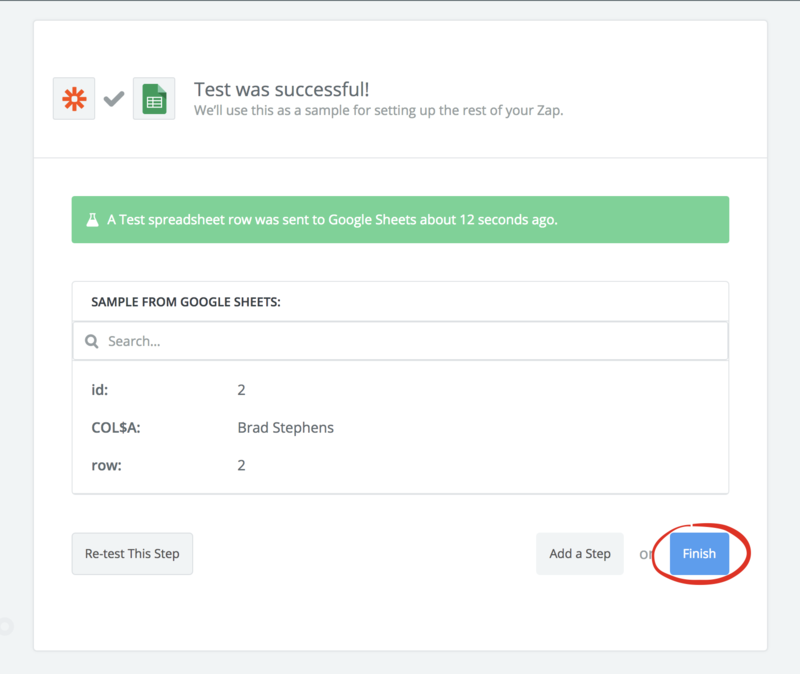 If the test is successful, you can either add another step or click "Finish" to complete the "Zap". By default, your zap will be turned off. Please remember to switch it on when you are ready. 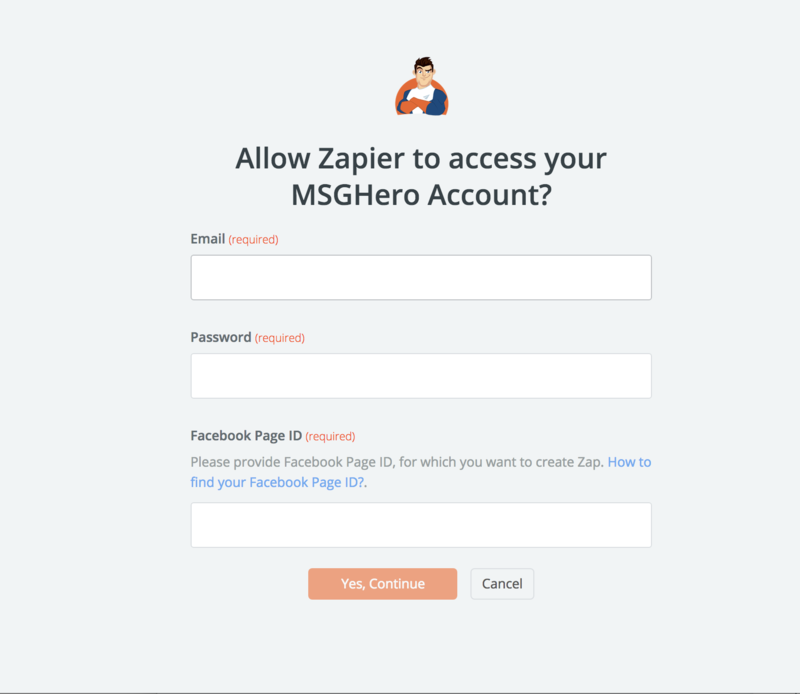 You've just created your first Zap with MSGHero!